Pat’s recently completed a charity cycle challenge to raise money for Children’s Hospice South West. She, along with friends Janie and Pete, completed the Hadrian’s Wall Cycleway in just three days. Here’s the first of her blogs about her adventures. Carried on along purpose made countryside track through park land and river meadows through little villages of Ovingham and Bywell and on to Corbridge where we stopped to look at the Roman ruins of an ancient fort. It was very well laid out and clearly marked where the granaries, bath house, garrison etc once were. I am always amazed to be reminded of their building skills with hippocuasts providing central heating and hot baths via ducts and hollow clay bricks supplied from wood burning furnaces – also their drainage systems for quite sophisticated latrines and run off from roads and roofs.We saw no actual sign of Hadrian’s Wall but plenty of road signs to it off to our right so we knew it wasn’t far away. After the ruin we cycled on to a great little pub at Fourstones where we ate roast pork sandwiches alongside a roaring log fire washed down by delicious beer shandy. We knew that this was the start of our climb to the highest point on our trail and although it was now dry it was still chilly and the headwind was strong. Fortified, we pushed on climbing steadily and the scenery started to change with stunted windblown trees and stone walls with sturdy long haired sheep and lambs keeping us company. There were many beautiful grey stone farmhouses and buildings but we were impressed how well kept they all were, painted in bright colours and renovated with particular care of the style and details to keep them looking as they would have been years ago. We pushed on into the wind steadily climbing, each of us now quiet as we delved into our inner strength of legs and mind to push against the force of the wind which necessitated us pedalling downhill! – reminiscent of our first 2 days of LeJog! Janie took the lead and whistled past Grindon Lough to the highest point on the ride 260m at Morwood on the southern edge of the Northumberland National Park – wild, high ground with no shelter and settlements tucked down in valleys and dips away from the relentless wind. We then had the pleasure of some downhill whizzes to Vindolanda, another Roman fort guarding Hadrian’s wall. Hadrian was something of a celeb as far as Roman Emperors go and was highly regarded. 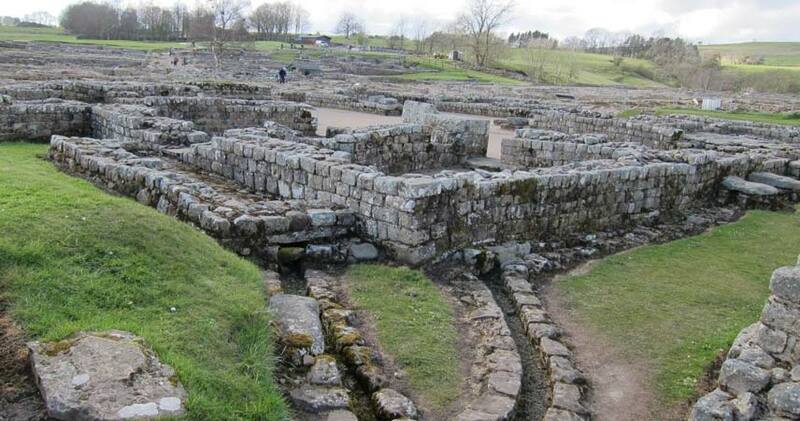 It was common knowledge amongst his peers that he was gay and here at Vindolanda he built a pleasure palace to entertain his friends. We stopped for a quick drink and a speedy look around the site where archaeologists were still excavating but we were getting chilled and it was getting late at 5pm. We pushed on to Haltwhistle and I must admit my legs were tiring and as we pulled up the steep hill through the town I wished this was our overnight stop. Never mind, just another 5 miles to the little hamlet of Greenhead to the welcome sight of the Greenhead Hotel. It was equally welcoming inside as we were greeted by a charming and friendly landlord who set up 3 bar stools for us in front of a roaring log fire and from where we stripped off outer layers and steamed gently whilst downing the best drink of the trip – a brandy and ginger ale which warmed us from the inside out. Janie and I had a room with a bath and took turns to soak away the strains of the day in the deliciously hot water. Pete had the best meal of the trip here – a home made steak pie but all the food was good and we crashed into nice comfy beds and up for a 7am breakfast. 57 miles.